I got wood in my stocking ... it's so great! Modern Tabletop – I love amazon wishlist. As a gamer it's very difficult for my friends and family to understand the things I like. To avoid getting another shirt I may or may not fit into or wear I started using amazon wish list a few years ago. Now I keep one for myself and the kids, if someone is looking for a gift idea I send them a link of they can search amazon to find it themself. For the kids it's help to keep their gifts age appropriate, within their interests and most importantly not duplicated so I don't have to return stuff. I'm beginning to re-look at a near future terrain project I've had sitting on the back burner. 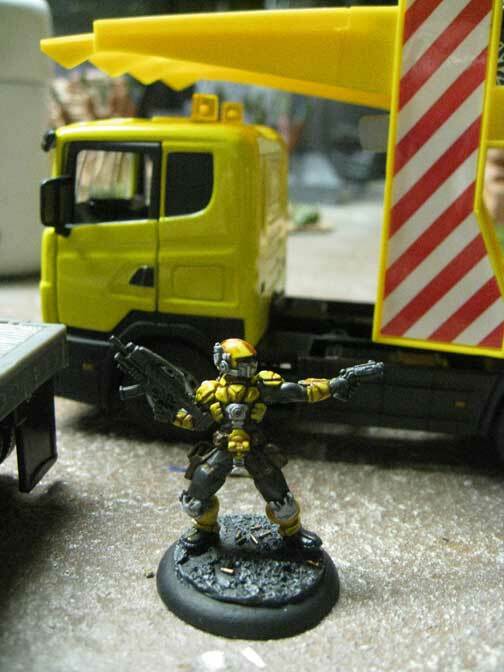 I've been kicking around the idea of running a Judge Dredd game as well as busting out MERCS again. Both of these games take place in the near future and as such need a different style of terrain than my ruined city scape from 40K and my wild west/victorian themed terrain from Malifaux. The problem with near future is getting it to feel right. We're obviously not going to have flying cars all over the place anytime soon. Maybe some type of hovercraft or VTOL style transports for the military and very rich but the common man is going to be stuck on the ground for the most part. 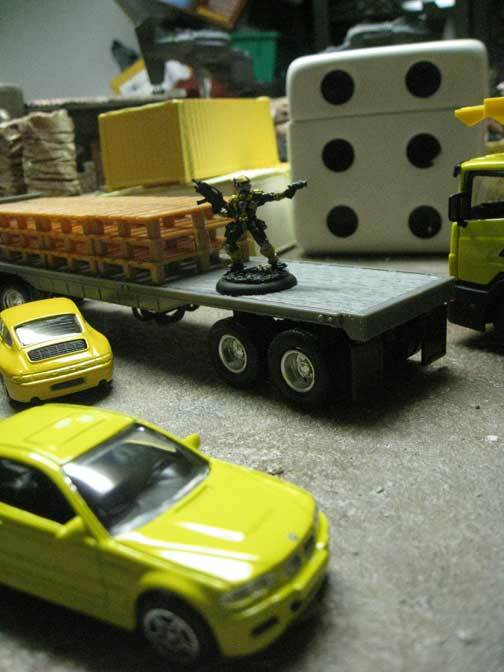 I like the take on vehicles from the Dredd 3D movie and also in Looper. In particular in Looper with many cars having solar panels or other modifications to older model cars to make them use an alternative fuel. It's subtle but you can see it if you look close. In Dredd they look very similar to what we drive around today. 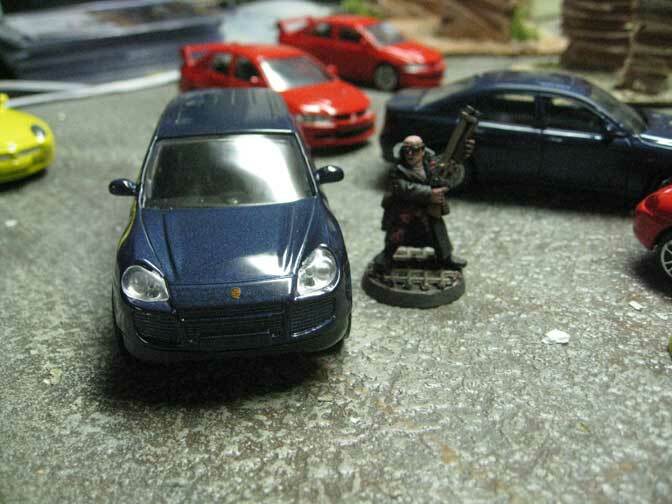 Keeping that in mind I've been looking for a good solution for cars in the 28-30mm scale. I've found the 1:43 scale is pretty close for most miniature lines in those scales. Some look chunkier than others but overall it's a passible solution. Having settled on a scale that should work I set off to find some cars that would work without breaking the bank. First stop was Toys R Us, having been in the car aisle more often as my son has decided cars are his favorite toy, I remember seeing something that might work. Toys R Us carries a store brand called Fast Lane which is fairly inexpensive and of decent quality. (This is the same brand that makes the Western Train I use for Malifaux) I was able to find some three-packs of 1:43 scale cars, mostly of the sports car variety, but higher up on the shelf I saw some semi-trucks in the same scale. One of which had a bunch of wooden pallets which will be useful for scatter terrain at a loading dock. They also had some helicopters that might be cool, but I passed on them at the moment. The next stop was Dollar General. Here I was able to find some 1:43 scale Bburago cars. These are also really close and they have a few different styles on the cheap (under $3). The store by me was fairly limited in selection but I was able to find a few different body styles. Once I got them home and unpackaged everything, (stupid twist ties and zip strips) I set them up with a variety of miniatures from different lines. 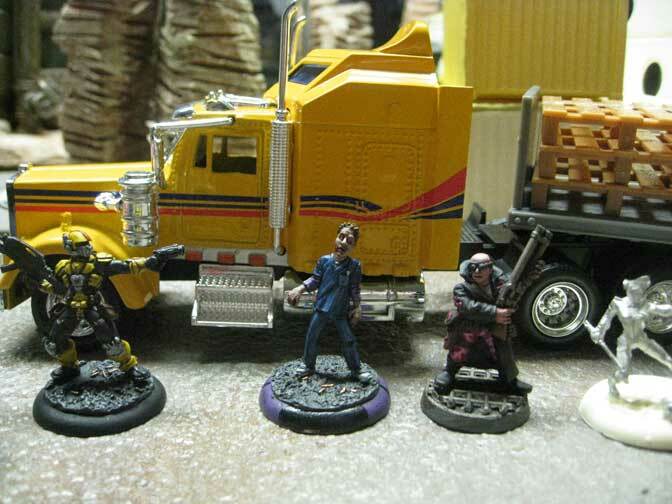 Pictured are a Zombie Stripper from Reaper, a Zombie from Studio Miniatures, a Judge Dredd model from Mongoose, a CCC MERCS model, and two Necromunda Gangers from GW. As you can see from the photos they're a really good fit. I imagine I'm going to need to repaint them all to match the look and feel of the models but until I get around to that they look nice on the tabletop.